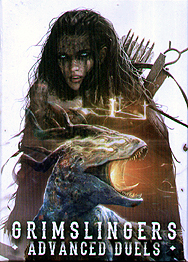 ...is the micro-version of Grimslingers, a strategic sci-fi western fantasy epic, and features a taste of both the versus and solo/co-op game modes. In Advanced Duels, players will face off using the elements and special spells called signatures to out-think, outwit, and outmanoeuvre their opponent. Players may then go solo, or join with a friend to face a simulation of the legendary "Witch King", which will test them like no foe ever has before.